Oslob is just an hour away from the Municipality of Dalaguete. The town of Oslob rose to fame after the news about the whale sharks' presence made it to the mainstream media. It has drawn thousands of tourists, both here and abroad. Swimming with the gentle giants is surely a great experience but extra caution must be taken. We paid Php 50 each for the entrance fee of the resort. From the beachfront, we saw a lot of boats with people swimming in the middle of the sea. And take note, it was still seven in the morning. A signage that can be clearly seen along the highway. We went to the other side of the resort and paid Php 300 per head before proceeding to the briefing tent. It was just a short lecture about the ecological importance of whale sharks and the dos and donts during the encounter. What caught us off guard were the exorbitant fees. Yes, you read it right, fees! You can't bring your snorkel gear unless you pay the Php 25 snorkel fee. Same goes with your underwater camera which cost Php 100. Hearing those 'fees' hurt my ears as well as my wallet (that is, if my wallet had feelings too). More so, if you don't have a snorkel gear, you have to rent one for Php 100 AND pay the snorkel fee for Php 25. I was like, "Kuya eh bawat hininga din namin ba, may fee rin?" Motorized boats are strictly prohibited as it pose great danger to the gentle giants. There was a reported incident when one butanding got hurt due to the boat's propellers. Woops. So from the shore, we paddled our way to the whale shark's territory. There were at least seven to eight boats filled with tourists who were so eager to swim with the whale sharks. And this is not a butanding. Tourists are not allowed to touch the whale sharks. One should be at least 5 feet away from the whale shark's body and at least 10 feet away from the creature's tail. Jerome, Robbie and I swam there for almost 30 minutes. I honestly got overwhelmed and intimidated by their size. Imagine a fish as big as a bus swimming a few meters from you. Ganyan kalaki mga friends! Just recently, a photo of a girl riding on top of the whale shark went viral and had caught the attention of the netizens. We all know that it is improper to ride on whale shark's back because (1) it's not a horse and; (2) try nga natin kung ang whale shark ang pumatong sa likuran ni girl? But seriously, this photo was taken at Boljoon, a town next to Oslob. People there weren't properly oriented about the nature of this animal. Well, at least the girl made a public apology and was truly regretful of what she did with the whale shark. Hence, this photo serve as a lesson for all of us. All in all we paid more than Php 500. It may be expensive to some but I do hope that the exorbitant fee will benefit the whale sharks. But if you asked me, I still enjoyed my experience. I traveled all the way to Cebu just to be with them. 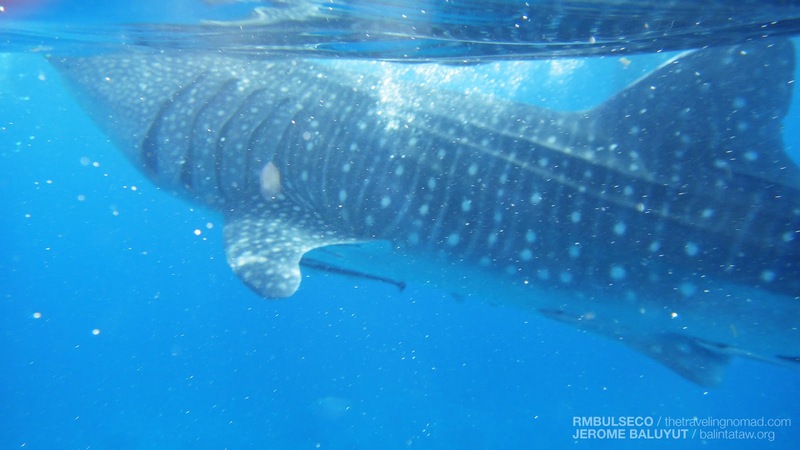 At present, there are no whale sharks swimming within the Davao Gulf area (although reliable sources have told me that they have spotted a few butandings swimming near Samal Island). It was an experience worth remembering, after all. Prohibited na pala? I honestly didn't know that. I am from Sorsogon but never been in Donsol to see the "butandings". Oo! Leche ang daming fees! 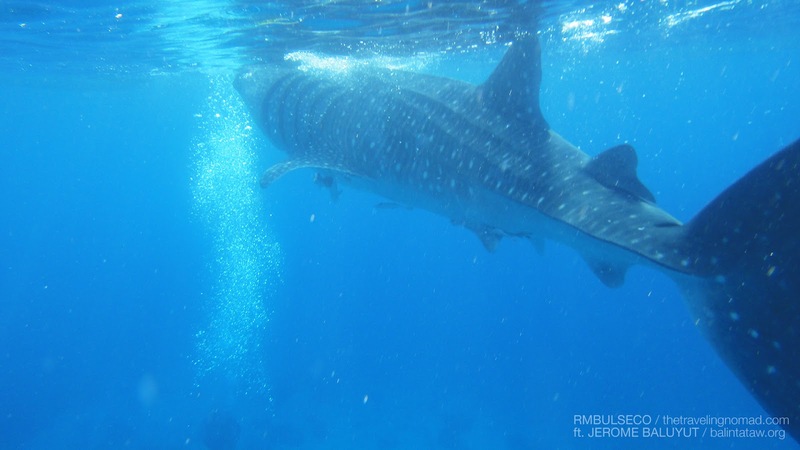 Pero yeah aminin ko, nainggit ako nang bongga when I read your post about your whale shark experience! Buti nalang at naranasan ko 'to! Kakaibang experience talaga! Panalo ah! anong camera gamit mo underwater renz? too bad that to be close to nature, we have to shell out some moolah these days (unlike before when everything related to nature was free - almost!). for sure, sulit naman ang bayad and seems like a wonderful and exciting experience. Heard there is a plan na taasan ang fees dyan sa Oslob, pero para daw muna sa mga foreigners, 1500 ata fee sa kanila, sana wag namang taasan yung para sa mga pinoy. When I was a young girl I saw a documentary about swimming with whales and ever since then I have wanted to do it! Beautiful post, excellent pictures! Wow, you went there pala. I was there last yr and I must say, they are AMAZING to the bones!! Something I will never forget, promise. i could only see this photo.we were not having this type of place to swim with sharks & i havn't seen a shark(big) yet .you are lucky bro. swimming with whale ,wow,it's so exciting. at bakit kailangang sakyan ang whale? bad girl. Na excite ko kadali, after learning the fees, murag nitumbling ko sa kamahal. Liver pod nila woi, dapat i regulate na sa local govt. BTW, Snaps are really awesome Renz, got close encountered with Butanding is simply astounding. Hope to experience it as well. Yes, I always thought they were only in Sorsogon too. Nice to know we can also take a peek at these majestic creatures in my hometown. Kris Aquino been their..feature nila yung oslob..last month ata yun..
Natawa ko dun sa "This is not a Butanding" Hahaha. Grabe naman sa dami ng singil. Pero atleast nag-enjoy kayo ng bongga! Sana matry ko din yan in the future. wow, what an experience, bro. sana me-experience ko rin to... Yahweh bless. Lalo na ang buhay na tubig like dagat. i hope someday i could experience this too! 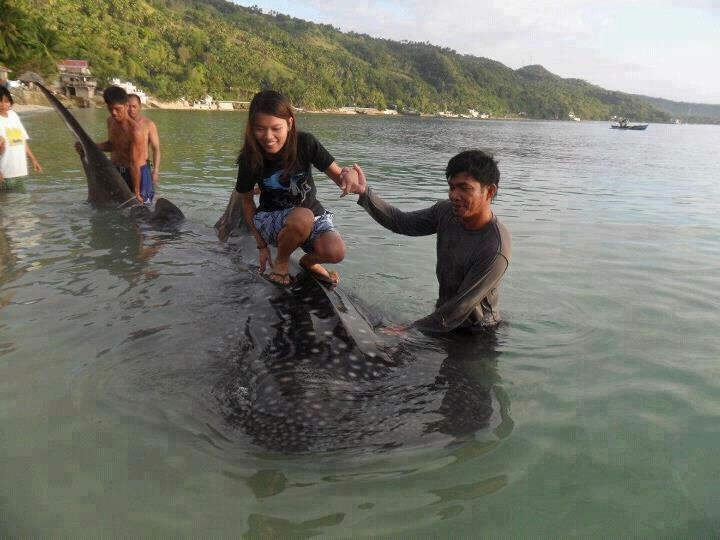 ngayon ko lang nakita yung pix ni girl na nasa likod ng whaleshark..
always been a dream to touch butanding... swerte mo naman, bro. sulit na sulit ung gastos for the experience... Yahweh bless. People from Tan-awan, Oslob say's that whale shark is a big blessing, many people got a good benefit from whale shark watching, they got a higher income compared to their way of living before. Wow! This is great and amazing. I believe this post will help a lot of people in regards of everything before the interaction with the whale sharks. Thanks for this one.